Through a story everyone can relate to about a man facing challenges on the job and in his family, The Arbinger Institute exposes the fascinating ways that we can blind ourselves to our true motivations and unwittingly sabotage the effectiveness of our own efforts to achieve success and increase happiness. 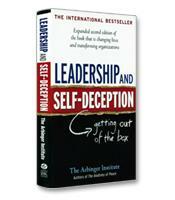 Read Leadership and Self-Deception and discover what millions already have learned - how to consistently tap into an innate ability that dramatically improves both your results and your relationships. How each of us has the problem of not knowing we have a problem. How to help rehabilitate employees who will lose their jobs unless some serious changes are made. How to institute a new way of tracking problems in your company. How to move from merely dreaming about a culture of responsibility-taking and accountability to actually experiencing it. A model for solving every problem encountered by your organization.